For the first time ever, a running pipeline approved by the Federal Regulatory Energy Commission (FERC) might get shut down. FERC issued the Southeast Market Pipelines Project a certificate in February 2016. The project includes three connected natural gas pipelines that would run over 680 miles through Alabama, Georgia, and Florida. 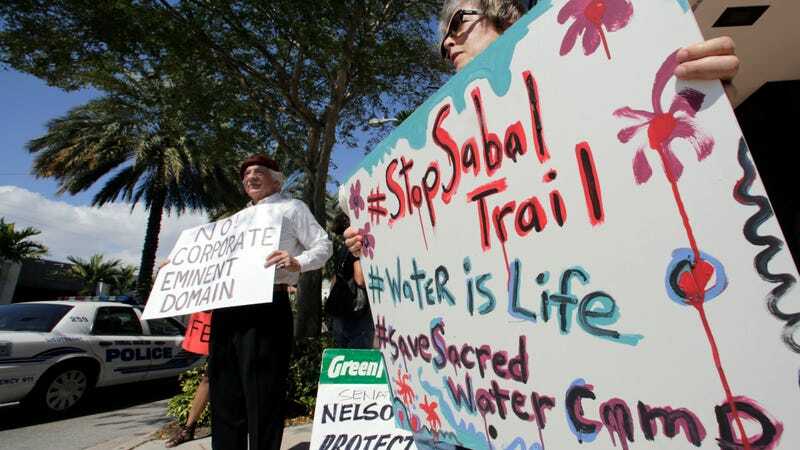 The one to receive the most attention is the Sabal Trail Project, and opponents were quick to try to stop this project from happening. The Sierra Club took the commission to court over its Environmental Impact Statement (EIS) on the project, which plaintiffs alleged didn’t properly assess the project’s projected greenhouse gas emissions—a requirement under the National Environmental Policy Act (NEPA). And the court agreed in August 2017. The pipeline’s been operating since July 2017, so pipeline developers Spectra Energy Partners LP, NextEra Energy Inc., and Duke Energy Corp. were trying to convince courts to leave the pipeline running while FERC revisits its analysis. Fast forward to 2018, and the project is on the verge of shutdown. That fateful ruling last year led to the D.C. Circuit on Friday rejecting these industry requests to keep the project up and running. That gave FERC just seven days to put out an order to reauthorize certificates, which it hasn’t yet done, and whip up a supplemental EIS, which it issued Monday, or risk an automatic loss of permits. Those seven days will be up Wednesday. A pipeline shutdown would likely result in energy costs shooting up for consumers, reports The Palm Beach Post. That’s why FERC requested the court delay the shutdown Tuesday, asking for 45 days to put together the official order to certify the pipeline. But if the pipeline does, in fact, end up shutting down, it would establish one hell of a precedent for future cases, says Jessica Wentz, a staff attorney with the Columbia Law School Sabin Center for Climate Change Law. However, as she points out, this case highlights a new reality for pipeline companies: “If you don’t do your NEPA analysis properly at the outset of the project, you may end up with more delays and more costs than you otherwise would have as a result of litigation,” she said. And this isn’t the only case using NEPA as a way to challenge fossil fuel projects. A separate case against the in-construction Atlantic Sunrise Pipeline Project, which is set to go through Pennsylvania, Virginia, and Maryland, is using a similar argument. The courts already denied the plaintiffs’ request to stop construction of the project in November, but they’re working on challenging that. A couple other cases are ongoing, too, as Wentz has written about. Whether they succeed depends entirely on the merits of the case and all that legal mumbo-jumbo, but this case against the Southeast Market Pipelines Project shows what can happen when FERC is so undeniably irresponsible. Update 2/7/18 2:11 p.m. ET: It turns out the pipeline won’t shut down Wednesday. FERC requesting more time bought it at least a couple more weeks while the courts look over the paperwork, according to E&E News. The Sierra Club is preparing its own response to make sure the courts decide whether to shut it down ASAP.